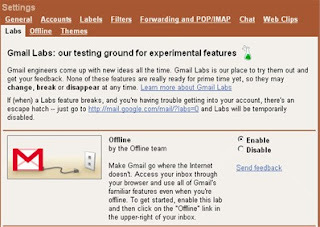 Access to the post office without a connection to the Internet to enable the settings in the Labs tab, and for the work uses technology GoogleGears. For their Gmail service, which enables the e-mail saved on remote servers via the Internet, Google has introduced a new function that allows you to work and when we connected to the Internet. New possibility to include in the card within the Labs and the work uses the Google Gears technology. After synchronization the user can read and search locally stored message, and if you make a new message it will be sent when you first connect to the Internet. Google has announced that will similarly be given access to the calendar, and believes that the application from the Google Apps in the near future get the opportunity and when the user is not connected to the Internet.